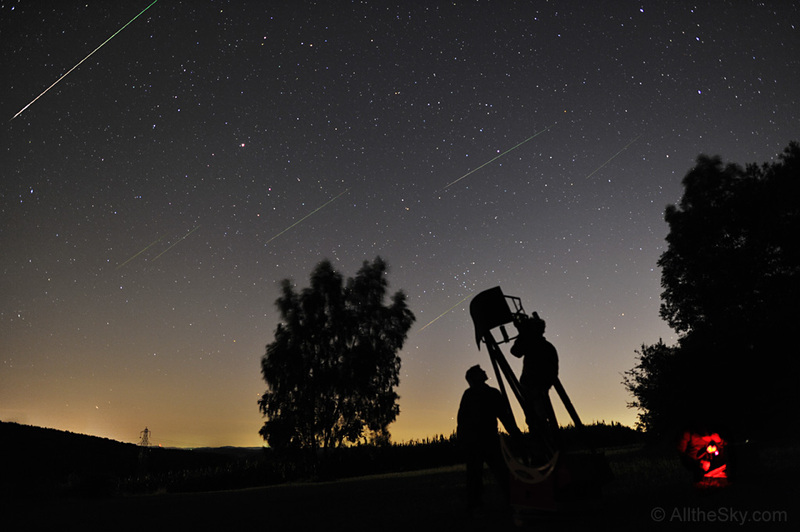 Time-lapse of a Perseid meteor over a period of 8,2min shot close to Landshut, Germany. Every 12s a picture with 10s exposure time was taken. The animation consists of 42 frames. The first image is included twice to make the entrance more visible. Last edited by bystander on Wed Aug 15, 2012 12:05 am, edited 1 time in total. I tried to make some timelapse of the Perseid's night and Milky way above Šumava (nearby Pancíř). When I saw this fireball, I was very sad, because I didn't know, if the wide-angle camera (Canon 550D, Samyang 8 mm, F5.6, ISO 1600, 30 s) cought this amazing and maybe the brightest fireball of the Perseid 2012. But I had another camera (Canon 450D, Tamron 17-50 mm, F2.8, 20 s, ISO 1600) so made some shots of the "dancing" disappearing trail. I was so surprised when I found out the first camera cought the fireball, so with all the "story" of fireball and it's trail I decided to make this mosaic. 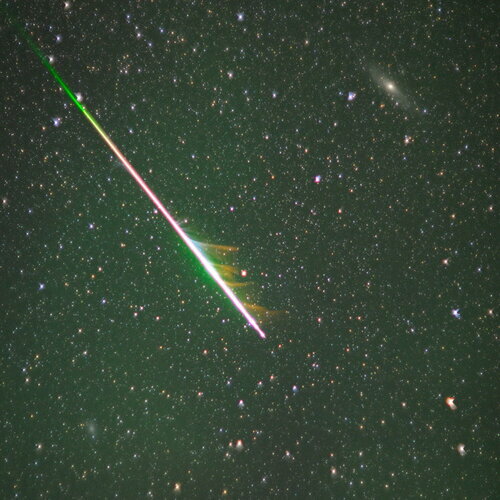 Saturday Night was a Meteor fever. We went out for a meteor camp on the Swabian Alb in southern Germany. Seven exposures from one and a half hour were combined. The Dobson telescope was used for observing some deep sky objects by astronomy students. Oh my gosh. Lovely images here. I've been staring at my screen for ages!! Thanks everyone.